I WAS delighted to see that The Talbot pub in Oat Market had dropped its modern name of The Frog and Ferret and reverted to its original title. I have never liked the breweries' trend for strange names, especially when they don't seem to make sense. Fox and Hounds, yes. But Frog and Ferret? Do ferrets have as link with frogs - or feast on them? Or had I missed some literary reference. I suppose that if they want to keep business the public houses sometimes have to go with the trend. Fortunately, none of the other Nantwich hostelries felt the need to follow suit - although we have other establishments where drink is sold that don't have pub-style names. The Cheshire Cat in Welsh Row had a series of other names, including Curshaw's at the Cat. Thankfully it changed back to The Cheshire Cat in early 2010 and (in 2015) it is still called that. At Nakatcha - converted from the Three Pigeons pub (not just a rename) you can eat, drink and dance. This is also in Welsh Row. On the other side of the River Weaver bridge is Harrison's Bar which does food as well as drink - a restaurant as well as a pub. It's complete with a terrace on the riverside corner - an outdoor area with tables. Of course, we lost The Lamb in Hospital Street when it became the apartments and shops complex, Chatterton House. 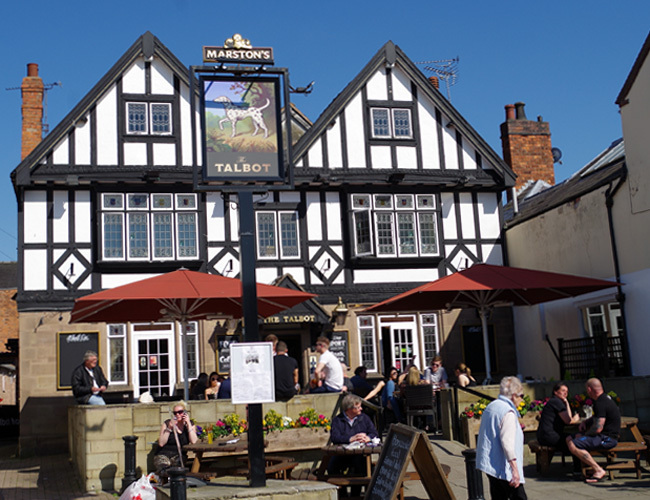 lThe Talbot has a fine open forecourt where customers sit at tables to drink but just after the change of name I saw two of the tables were covered presumably for the use of smokers in rougher weather after the new law on no smoking in public places came in. But the view has not always been so open. Many years ago there was a cottage or two built on the street line with the pub situated behind them, presumably up an alleyway. 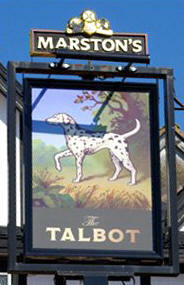 Did you know that name Talbot comes from a breed of dog first put on their coat of arms by a family called Talbot? The dogs were used for hunting (like a fox hound) or for running alongside stage coaches. That makes sense as we were a coaching halt in the old days. 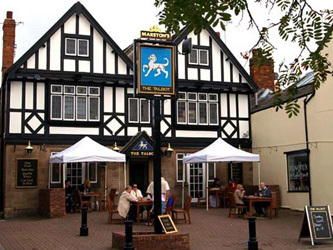 There are a number of pubs throughout the country with the name. In some signs, the dogs are spotted, as here - in others "plain", as we had in 2007.
l There was a Talbot's shoe shop in Beam Street, on the corner of Pepper Street - named after the owner. So congratulations to all concerned for bringing a piece of history back to the town. Gone is the peach-and-black decor of The Frog and Ferret. Back is the black-and-white exterior. I won't go into the changes made in a £60,000 renovation. I will leave customers to find out about the locally sourced food, the car park at the rear, the planned dining terrace, and the "family-friendly" atmosphere. I noticed from before and after pictures that a feature of the gables had been removed. But I don't know when this happened. In the renovation, possibly. lIf you look at the stained glass in an upper window you can see a dog's head (a Talbot). lThe Talbot was the arms of the Earl of Shrewsbury although, says Andrew, he has yet to see any evidence of links with the family and the town.